Friday, March 31 is Cesar Chavez Day here in California, which meant that I (as a quasi-County employee) got the day off. 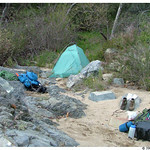 So we decided to take a three-day weekend to go backpacking, hoping that it would work out better than last time. To play it safe, we planned our trip for nearby Cleveland National Forest, which is just barely north of San Diego County. We started off on Friday morning, leaving the house around 8:00 am. We got gas at our favorite Circle K in Mira Mesa, then headed up I-15 a few miles to Rancho Bernardo, where we stopped at the Cleveland National Forest Supervisor’s Office to buy our wilderness pass. We got back in the car, satisfied that there would be enough water in the creek for us to pump drinking water, and headed north on I-15. We exited in Murrieta and headed west. We passed the requisite new housing McMansion developments, then found ourselves in horse country, surrounded by ranches with legitimate mansions and acres of horse pens. There was even a polo ground in the middle of the place. Not the ghetto! Just before we turned off the main road onto the Cleveland National Forest road, we saw a coyote head up the hill along the street. We slowed down and looked at him for a minute, and he stared back at us. We wondered what kind of wildlife we would see while in the backcountry. It had been overcast all morning, with an occasional drizzle. The forecast had said that it would be overcast, with “rain late”, and a 30% chance of rain. So, I wasn’t too concerned about getting wet. We arrived at Tenaja Trailhead and were the only car parked in the parking lot. We hit the trail about 10:00 am. The sky was pretty dark, and it did sprinkle for a little while as we hiked. The weather, and the fact that we were likely the only human beings in that area of the forest, made the trail seem surreal. After the initial descent from the parking lot into the canyon, the trail was lush with all kinds of foliage, large and small. There were tall coastal live oak, shrubs with tiny purple or white flowers, ferns in some places cascading out of the rock, and mushrooms popping out of the ground. It was like we had stepped into an oaken fairyland. Despite the rain, which let up before long, we had a great hike. It was mostly downhill. 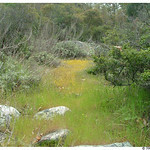 The trail was well kept, though slightly overgrown (attributable to recent spring rains) and a bit uneven in parts. The trail varied quite a bit in many ways – the views, the foliage, the terrain. From the trailhead to the first landmark, Fisherman’s Camp, is 3.5 miles. We hiked along without incident, and made very good time covering that mileage. We arrived in Fisherman’s Camp around 11:50 am. It was still overcast, but not raining. We stopped for a lunch of bread, pepperoni and cheese, and oreos. At Fisherman’s Camp the Tenaja Trail intersects with the San Mateo Trail, which goes west in one direction and northeast in the other direction. 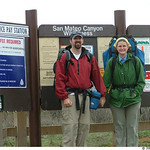 Our plan was to try to hike another four miles or so west along the San Mateo Trail. There were no real landmarks in the direction we were heading, or specific campsites that we were aware of, so we were pretty much improvising from this point on. We made excellent time for the next couple of miles. The next trail junction was 1 mile past Fisherman’s Camp, and we were there at 10 minutes after 1 pm. This is where Tenaja Trail splits off San Mateo Trail and heads north through the center of this particular ranger district of Cleveland National Forest. We continued west, and quickly came upon the next (and final, for today’s trip) trail junction, where Bluewater Trail heads north, and San Mateo Trail starts to veer south. The 1.7 miles from Fisherman’s Camp to the Bluehead Trail junction were at higher elevations, affording superb views of the surrounding hills and the creek below. Occasionally a large bird would fly by (we’re pretty bad at identifying wildlife, but we saw raptors – hawks maybe? – and large waterfowl, which were perhaps herons) but that was pretty much the extent of our wildlife interaction. …Until about 10 minutes after the the junction. I had been walking in front the entire day, gleaning the firstfruits of the spiderwebs that spanned the trail, as well as the ticks that hid in the grass. Throughout the day, as we heard rustling in the bushes along the trail, we invariably found it to be birds. But this time, I heard rustling and saw an unmistakable small fuzzy black and white animal. I turned around immediately and said to Dave, “Go back, go back! Skunk!” We scurried about 50 feet back on the trail, then turned around to see if anything had happened. The skunk didn’t seem to have really noticed us (or, if it did, it scurried a different direction). We looked down and noticed we were standing in an ant colony, so we had no choice but to move cautiously forward. As we passed the bush where the skunk had been, there was no trace, visual or otherwise. We were thankful to have been spared being sprayed by the skunk. We kept hiking, and took a 10 minute rest break a while later. The trail along this part of the canyon was much more overgrown than the first half, and a lot of the flat parts were very grassy. It was very secluded, with few traces of humans (other than horses’ hoofprints in the muddier spots), and the overgrown nature of the foliage and the overcast skies continued to give the afternoon a surreal feel. It was probably around 2:30 pm when we came to the toughest creek crossing yet. At this point, the creek was a width that could almost be labeled “river”, though of course very shallow. On a dry day in the middle of summer, there would probably be very little water flow, and the rocks would be easy to walk across. However, on this day, it was impossible to go straight across where the trail markers indicated. It took us a while, but we ended up doing a zig-zag hopping across various kinds of rocks in order to get to the other side, then made our way back several feet to where the trail continued. By this point, my leg muscles were starting to rebel. I told Dave that we should probably walk for just a short while longer, and then look for a place to camp. About 10 minutes later, we came to another creek crossing. This one wasn’t as wide, but the way the rocks were shaped made it awkward to simply hop across. Dave crossed ahead of me, and in the meantime I got my foot stuck in one of the rocks in the middle of the creek, and dunked the other foot in while trying to dislodge. Twice. It was a sign – this day needed to be over. We made it across the creek and tried to find a place to camp. There were one or two flat places next to the trail, but they seemed to be covered with poison oak (my foliage friend). We thought about continuing up the trail a bit, but it looked like it was going up the hill, which meant that it wouldn’t come to another camp site very soon. We later calculated that we had gone not quite 3 miles past Fisherman’s Camp. A little shorter than anticipated, but it was the right amount for the day. We followed the creek a bit, and finally Dave discovered a lovely camp site sheltered by some large rocks, and very close to the creek. The ground was sandy and would be relatively comfortable, though perhaps not as level for sleeping as one might hope. I took off my boots and walked around in the sand. It was about 3:15 pm at this point, though it was quite dark because the clouds refused to clear up. It was a little earlier than we’d planned on stopping. Because we didn’t really have anything else to do, and because we didn’t want to get cold and/or wet by staying out too long, we made dinner by 4:30 pm. I had found a recipe online that involved sauteing onions & bellpepper, adding kielbasa, and then adding instant rice and potato flakes (and water of course). As we watched it cook, it didn’t look too appetizing. We wondered if the potato flakes were a mistake. It turned out to be quite yummy, though. It wasn’t delightful to clean, but it actually washed up better than expected. By 5 pm we were all cleaned up and ready to head into the tent. We spent a couple of hours talking about all kinds of random things (because we weren’t quite tired enough to go to sleep that early in the evening), and finally went to sleep sometime after 7 pm.